Jeremy Allison has now joined Novell as well. He will be in a number of conferences in Germany this week. Am a big fan of John Pilger's articles and books. And while doing my daily delicious popular browsing I found a torrent for Pilger's Palestine is Still the Issue documentary. The documentary aired in the UK, and I had read the blurb on his web site a few years ago. Mono offers a mechanism to run your .NET code on non-Unix systems by providing a CLI execution environment. Mainsoft has taken a different approach. Mainsoft wrote a translator that integrates with Visual Studio that converts existing .NET applications into Java applications by translating the CIL bytecode into JVM bytecodes. Mainsoft has historically focused on server-side deployments with their product (Integrating ASP.NET with J2EE and bringing Visual Studio debugging to J2EE). But Erik Sink from SourceGear needed to bring the Vault software to Eclipse users. Erik wrote an article on how he got his .NET code to run inside Eclipse using Mainsoft's products, it is available on Microsoft's web site. The programming language Boo is gaining popularity among developers. Boo is an open source Python-like language that has been designed to integrate into an ECMA CLI virtual machine, so it integrates things like properties and attributes directly into the language. Boo is a statically typed language very much like C#. This means that Boo will produce optimal strongly typed CIL code, but if you need the flexibility of dynamica types it makes this available through type inferencing or dynamic typing. Intellisense Support for Boo in MD. Configuration Page for Boo Add-in. Lluis updates us on Mono's ASP.NET 2.x status. Cullen pointed me out to McSweeney's take on Writing your own Thomas Friedman OpEd. Christian Hammond has posted some screenshots of the new VMWare 5 with its snapshotting GUI here. There is a blog dedicated to Ajax for .NET here (from AjaxMatters). The book on Asad that I was recommended is awesome, it gives a different perspective on the Lebanon war from the Syrian point of view. As I was reading the book, Amazon introduced a new feature that allows customers to see a list of books referenced by a given book. I used this to get myself a couple of other books: "Israel's Lebanon War" and Abu Nidal: A Gun For Hire. In "Israel's Lebanon War" has an excellent introductory chapter on the Lebanese civil war as witnessed from Israel. The book relies on interviews and de-classified documents from the Israel government to recreate the Israeli involvement in Lebanon. I have not finished this book, but it is a good complement for Robert Fisk's "Pity the Nation" narrating the gradual involvement of Israel with the Phalange party. The book begins in the early years of the Lebanese Civil war (1977) and describes the rise of Bashir Gemayel from the low ranks of the Phalange Militia to its control of the other Christian militias through the assassination of his opponents to the presidency. On the other side Menachem Begin starts to empathize with Bashir's struggle and conceives a plan to make Bashir Lebanon's president. He relies on Ariel Sharon, his secretary of defense, to put together a plan to destroy the PLO, reach Beirut and install this new government. Such a plan would have been rejected by the Israeli Cabinet, so they have to prepare and operate in secret and only give as little information as possible to the Israeli Cabinet. To make their case they have to withhold negative information and intelligence assessments from the Cabinet and paint a rosy picture of the invasion. To get the cabinet to approve the plans, they present them with a limited plan: a military invasion of southern Lebanon of about forty kilometers. The real plan is to reach Beirut, but this will not be disclosed to the rest of the Cabinet until the invasion starts. The invasion plans faced a problem. There was a cease-fire in place between Israel and the PLO on the border and as long as the palestinians did not attack there would be little reason for an invasion. Arafat had managed to curb its guerrillas from responding to provocation (which included bombing and shelling of their cities and positions). Patrick Seale's "Abu Nidal: A Gun For Hire" is addictive and non-stop reading. A book tracing the inner working and operations of Abu Nidal's terrorist organization. Abu Nidal started a resistance group which splintered from the mainstream palestinian opinion in the 70's. Abu Nidal's would transform his group from an extreme palestinian group into a work-for-hire organization that would carry out terrorist attacks against the enemies of his sponsor of the day. Most importantly Abu Nidal broke early on with the PLO and did everything he could to destroy the moderate palestinian voices. The book recreates Abu Nidal's operations, its mode of operation and some missions it carried out by interviewing collaborators, defectors and opponents. The book starts by tracing the steps of a new recruit in the group, and then exploring the claim from a senior PLO officer: that either Abu Nidal's Organization was infiltrated by the Mossad or Abu Nidal himself was working for the Mossad. The exploration of this claim takes the rest of the book as Patrick Seale reconstructs the various terrorist strikes carried out by Abu Nidal. In this book, Lebanon appears only as a backdrop to the mainline story. In any case, Abu Nidal's strikes consistently undermined the efforts of the PLO and the palestinian cause which he claimed to be assisting. Attacks would set back any attempts from the PLO to become a political force to represent the interests of the Palestinians in the exile and on the occupied territories. Abu Nidal's group carried out an attempt to assassinate the Israeli ambassador in London in 1982. This was taken as a violation of the cease-fire and the invasion of Lebanon begun. A lebanese makes fun at the current state of affairs in Lebanon. Another one: How-To for a Lebanese Cabinet. A few months ago, I was also recommended `From Beirut to Jerusalem' from Thomas Friedman. I never quite liked his articles on globalization in the past and I was skeptical about his book, but I gave it a shot. I could barely read one third of the book, as it felt mostly like a shrine that Thomas Friedman had written about himself, it felt very much like a `me, me, me book'. I mention this now because I found two interesting articles: Write Your Own Thomas Friedman Article which captures more elegantly what I disliked about the book. a. The future of civilization depends upon open communication between Yasir Arafat and Ariel Sharon. If the two don't speak to each other, the world edges closer to the precipice of total war. If, on the other hand, they manage to engage in open conversation and resolve their differences, Israelis could soon be celebrating Seders in Saudi Arabia. But for now, the two men can't speak. Why? You can't make a collect call from Bethlehem. a. My first thought was to ask: Why no collect calls from Bethlehem? It's easy to call collect from Bosnia, Kosovo, even Uzbekistan. Am I sure? Of course I'm sure. I was in each of those places just a few weeks ago, making collect calls all over the world. No problem. So why can't Arafat call collect from Bethlehem? a. How can Islam get to its future, if its past is its present? b. Later that day I got to thinking about global civilizational warfare. There are wars that open you up to something new and exotic, those that are old and familiar, those that bring up lots of questions, those that bring you somewhere unexpected, those that take you far from where you started, and those that bring you back. But the most exciting, challenging and significant clash of all is the one you have with your own civilization. And if you can find a civilization to love the you that you love, well, that's just fabulous. c. Maybe Arabs and Israelis aren't from different planets, as pop culture would have us believe. Maybe we live a lot closer to each other. Perhaps, dare I even say it, in the same ZIP code. a. The Jacuzzi was nearly full when Ayman al-Zawahiri, former surgeon and now Al Qaeda's head of operations, slid in. b. It was Thomas Pynchon on the phone. "Tommy," he said, probably aware we share that name ..
c. Despite the bumpy flight, I felt comfortable in the hands of a pilot as experienced as Amelia Earhart. a. I visited Mohammed bin Faisal Al-Hijazi, former top aide to Ayatollah Khomeini, now a reformer and graduate of the Wharton Business School. b. Last year Nura bin Saleh Al-Fulani worked in Gaza sewing C4 plastic explosives into suicide bombers' vests. I caught up with Nura last week in Paw Paw, Mich., where she sews activity patches on the uniforms of Cub Scout Pack 34.
a. My daughter Natalie, a student at Eastern Middle School, a public school in Silver Spring, Md., asked me at breakfast: "Daddy, if my school has students who are Muslims and Jews and Christians and Buddhists all working together, why can't the rest of the world be that way?" There was something in the innocence of her question that made me stop and think: Maybe she has a point. a. Driving into Bethlehem in the back of a pickup, I wonder: What if Yasir Arafat and Ariel Sharon sit down and play a game of poker? And what if the stakes are these: If Sharon wins, the Intifada is over. If Arafat wins, Palestine gains statehood. One game of no-limit Texas hold 'em, and the Middle East crisis is resolved. Just like that. Yasir and Ariel, deal 'em out. And a very funny review of his new book. Sebastien has two nice articles: Graphs to visualize security demands and the fourth part on the series of the Mono Security Manager. Sebastien is using the Cecil introspection library by JB to extract the CIL bytecodes and trace the use of the security manager. Carlos Alberto points to an article with quotes from around the world on the recently staged coup. And has details on Mexican Ambassador to the US campaign to stick his foot in his mouth. He is mailing newspapers trying to justify the coup staged against Mexico City's major by the federal government. He is arguing that technically they are allowed to use a technicality to block Lopez Obrador from running for the presidency. The Boo language integrated into MonoDevelop: description and screenshot. I have been considering for a while to write about the creative coup being cooked in Mexico. It is a creative coup, because nobody had thought of this before. If there is one area where we mexicans excel is in coming up with some crooked schemes. This time is the turn of President Fox. President Fox is using a technicality on a minor issue to block his strongest opponent from running on the upcoming elections. I envision many countries will be able to follow Mexico's leadership on this new twist on bringing improved democracy to their people. The trick is simple: make sure to sue your opponent shortly before he presents his candidacy for the elections. You must ensure that your country has, or passes a law that will allow you to keep people under investigation to run for office. Laura Carlsen's article gets to the facts quickly and with no verbiage. When Vicente Fox ended the 71-year reign of Mexico's Institutional Revolutionary Party in the 2000 presidential elections, many observers heralded it as the beginning of a long-overdue transition to democracy. Now President Fox, in a concerted effort with members of the former ruling party, has closed the door on that transition. By orchestrating a pseudo-legal offensive against Mexico City's popular mayor, Andr�s Manuel L�pez Obrador, Fox has not only dashed the hopes of Mexicans for a real democracy, but has also destroyed the political capital he gained back in 2000. Hundreds of thousands of people gathered in Mexico City's central square to protest Congres's decision to strip L�pez Obrador of immunity to prosecution granted elected officials. The mayor will now stand trial for allegedly failing to follow a court order to halt work on an access road to a local hospital. According to the federal attorney general's office, the government will likely put L�pez Obrador behind bars, as a "preventive measure," before the trial even starts. The president and his Secretary of State initially claimed that they were not involved in this activity, until the details about the secret meeting between them and a federal Judge came to light exposing the complot. Oops. They blamed the opposition for `politicizing' the issue. The trial for Andr�s Manuel is over a minor problem (read the article for the details), and you have to wonder about priorities. In the meantime, Fox has yet to answer to various charges of corruption in his administration involving his own campaign, Petroleos Mexicanos (the state owned oil company), his special properties, the use of federal resources for his personal use and the Cuban scandal. The Cuban scandal is probably the best, it is like Watergate but ten times bigger: infiltration, complots, video-taping, bribery, federal agents concocting against the opposition parties. It has it all. The only difference is that nothing is happening to Fox. On the economic side, the last week saw the largest capital transfer out of the country since the 1994 depression (the one that would bring the dollar price from 3 to 10 pesos). So we are dealing with a special kind of weasel here: a dumb weasel. Edd is back from Lebanon. Edd, who was the first person to tell me that Lebanon was a great place to visit, just came back from his second trip to Lebanon. He posted parts of his travel log and some pictures on his blog. Updated screenshots of GPE Palmtop Environment are available here. GPE is royalty-free GUI framework for embedded devices and is based on the Linux, X and the Gtk+ toolkit. Progress on the OpenOffice/Mono front, here is a screenshot from the OOo/Mono team: Sample C# program running in OOo. Loved the article of Joel on Picking a Ship Date. As usual, he has various entertaining stories to make his point. Both Red Hat and SUSE have their Linux distributions shipping every six months (Fedora Core and SUSE Professional) which in my opinion burns too many developer cycles on testing, quality assurance and documentation. Except for a few fairly obscure developer features each distribution is hardly distinguishable from the previous version. Maybe its a good thing that these features are released on a six-month based schedule, but in my opinion they are not as important as they used to be. In the early days of Linux the the a.out to ELF migration or the libc5 to glibc migration would have every Linux user running to download the latest distribution. If you have a lot of validation and unit tests, and if you write your software carefully, you may get to the point where any daily build is almost high enough quality to ship. I have a similar feeling with my Linux distros; I tend to stay with my current distribution for very long periods of time. Literally, only when forced to upgrade through dependencies I consider an upgrade. Maybe am no longer a sophisticated user. Joel has a series of new articles on the creation of his FogBugz, which am sure Joel readers have already clicked through: Part I, Part II, Part III and Part IV. But mostly because I'm a pedantic windbag who can't resist the opportunity to teach a little lesson to the younguns who think that a compiler has to generate machine code. Interesting read on blogs, IM, presence, wikis and our humanity on Adam's blog. The challenge now is whether Ray and Groove, which represent forces of architectural innovation, can have a successful impact at Microsoft, which after all, is a large (58,000 person), middle-aged (30 year-old) company. It's hard to know whether the loss of nimbleness due to size and age is a greater challenge to Microsoft than is open source. I have finally started looking at Microsoft's Indigo, and am disappointed at it for various reasons, maybe I will write something about it later. In the meantime, I started to learn about ZeroC's ICE which seems more useful as a basic RPC framework. From the Electronic Intifada diaries: International peace observers report on the militas attacks on palestinians on the West Bank and poisoning of their flocks. A more comprehensive article is available on Zmag. The report is out. The culprit for the war was "Curveball" for feeding bad intelligence. Everyone else can now go and get a raise. Jon has authored SharpMusique: a port of PyMusique to C# on Gtk#. 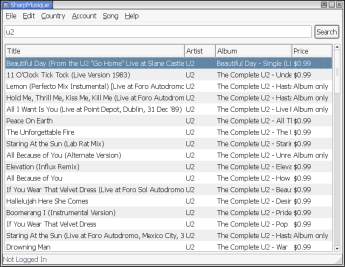 SharpMusique is a very useful tool, but in addition Jon is shipping a C# binding ("VLC.cs") to the VideoLan library. VideoLan is a cross platform media framework, so this is quite convenient for folks developing cross-plaform media apps with Mono. The only mistake of the afternoon was allowing Nat to test drive SharpMusique while I was logged in. An interview I did while in Turkey: here. Scott Ritter, the weapons inspector that predicted that there were no weapons of mass destruction in Iraq has written a new article Sleepwaling to Disaster in Iran. I enjoy reading Helen Thomas as well, her latest piece is: Screened Audiences, Fake News Promote Bush Agenda. The day after my return from Beirut, Duncan and myself took a cab back home late at night. The cab driver was a Lebanese which overheard our conversation and suggested the book Asad of Syria: The Struggle for the Middle East. Someone had recommended this book before. So far, the book has been excellent, non-stop reading. I am giving it five stars in Amazon. Amazon keeps findinding ways of emptying my wallet. First the free-delivery service, and now they have added a list of books referenced by any given book. A feature that I have been properly abusing.